There is an often expressed belief at WUWT that temperature data is manipulated or fabricated by the providers. This persists despite the fact that, for example, the 2015 GWPF investigation went nowhere, and the earlier BEST investigation ended up complementing the main data sources. 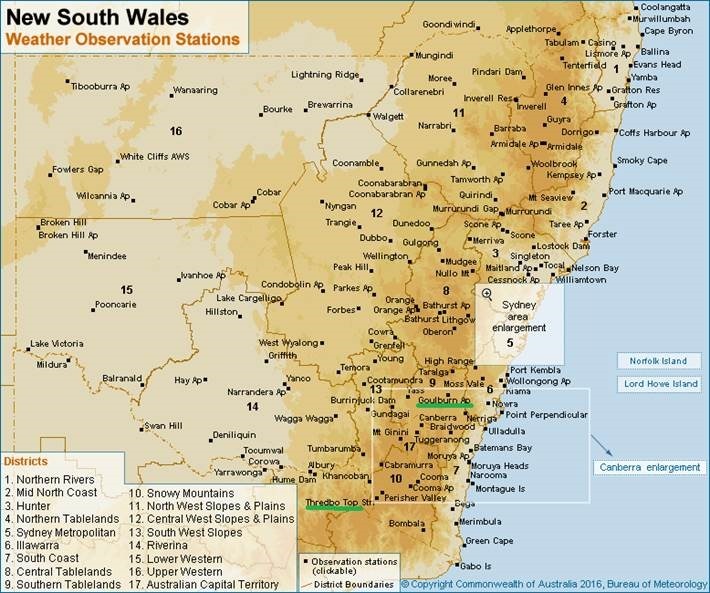 In this post, I would like to walk through the process whereby, in Australia, the raw station data is immediately posted on line, then aggregated by month, submitted via CLIMAT forms to WMO, then transferred to the GHCN monthly unadjusted global dataset. This can then be used directly in computing a global anomaly average. The main providers insert a homogenization step, the merits of which I don’t propose to canvass here. The essential points that you can compute the average without that step, and the results are little different. I switched because I am now following a post from Moyhu here, and I want a GHCN station which I could follow through. But it is the same format for all stations. This data is from 4 December 2016, and I have highlighted in green the min/max data that will flow through (unchanged except for possible quality control flagging) to GHCN unadjusted. 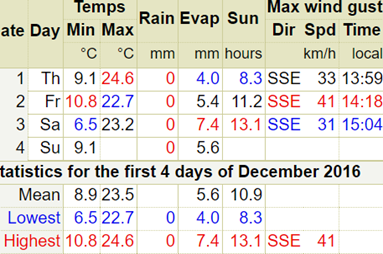 It shows for Melbourne Airport, the most recent temperature (22.4) at 7pm, various other data, and then the min and max, along with time recorded. 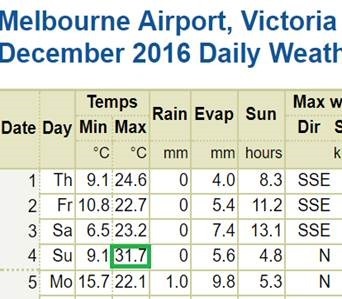 The min is incomplete; it showed the latest 7pm temperature, but would no doubt be lower by 9am the next day, which is the cut-off. The max probably wouldn’t change. You can see the headings by linking to the page here.